Will this still be a food blog? Who knows? Let's face it....I lost touch with all the recipe posting longggg before I decided to take a break. I haven't actually stopped cooking though. Sometimes I need to "re-up" on the inspiration, but it doesn't mean I ever stopped getting experimental in the kitchen. I still hate to measure AND I still loosely follow almost EVERY recipe I attempt to make. The recipe below is a prime example of that. THIS is the original recipe I set out to make when somehow things took the typical turn. 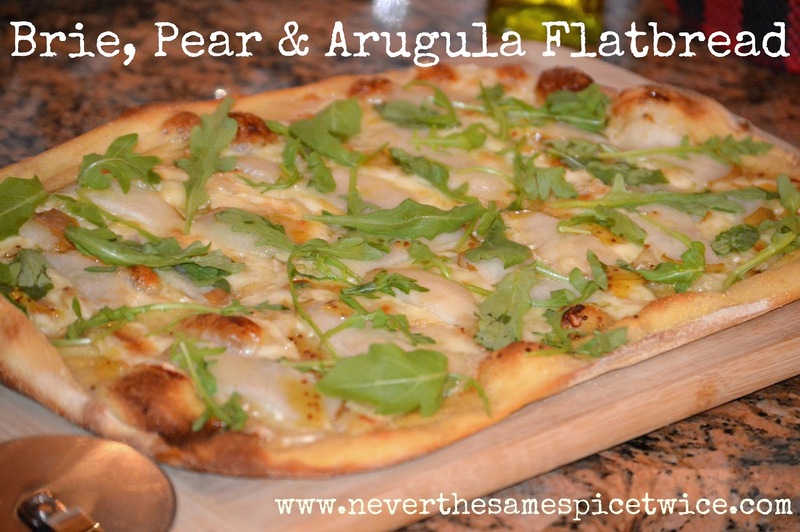 I ended up going more with a combo of that grape/brie one and a favorite flatbread recipe from a restaurant by me called City Fire that uses pears. I guess that's where this creation was born. In my very own and specific words...the best that I can remember 5 days ago...here is the recipe for this yummy deliciousness! 1. Pre-heat your oven according to the directions on your dough (I think the Publix dough is 450 degrees... but I'm not 100% sure). 2. Whisk together the extra-virgin olive oil, whole grain mustard, dijon mustard and honey. 4. I (this would be my job) brush the dough generously with the honey mustard mixture. Save a little bit to drizzle over the top when it's done. 5. Top the pizza with the brie cheese. 6. Cook your pizza part of the way - then take it out and add the pears to finish it off. (My pizza cooked for about 20 minutes, after 10 minutes is when I added the pears...the last 10 minutes was a perfect amount - you may need to use your judgement). 7. When it's all done and the crust is cooked to perfection....top the pizza with arugula and then drizzle it with the rest of the honey mustard mix. Make more if you need to...because chances are good that I way underestimated my measurements. SORRY, I'll get better at this! Enjoy! It's CRAZY good...we will definitely be making it again!